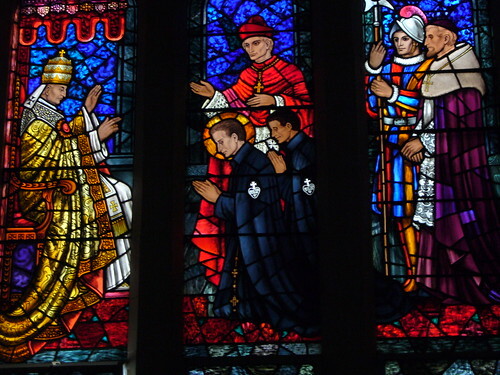 I’ve gathered together some bits and pieces that I have written over the years on Saint Paul of the Cross and, with the help of weebly.com, I have created a little site for those who want to read something about him and his spirituality. The site is called Passio in Cordibus, recalling the words of Saint Paul of the Cross May the Passion of Jesus Christ be always in our hearts. It’s very unfinished, but I hope I will get some technical support and helpful improvements from my guardian angel over the next few months. In the meantime, I wanted to make these texts available as near the Feast of Saint Paul of the Cross as possible. The picture used on the site is a detail of the above picture of Saint Gabriel, which in turn is a detail from a large painting in the Passionist church at Brugnato, Italy. 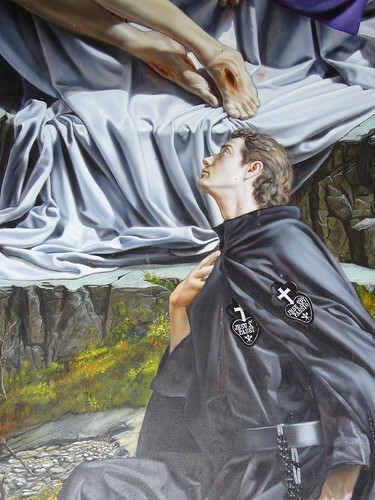 You can see the full painting on the Passionist Vocations site. Today in the United States is the Feast of Saint Paul of the Cross (-yesterday’s feast of the North American Martyrs used to take precedence there, so Saint Paul moved back a day to 20 October in the U.S. Calendar). Glenn Dallaire, who set up a website on Saint Gemma Galgani a while ago, is launching his new site on Saint Paul of the Cross.